Login to all your Dartmouth WordPress sites from the link in the footer of this site. When your Dartmouth WordPress site is setup, you should receive an email containing your username and a link to login to your site. You may also log into Dartmouth WordPress using the Login link at the bottom of the pages on this site. 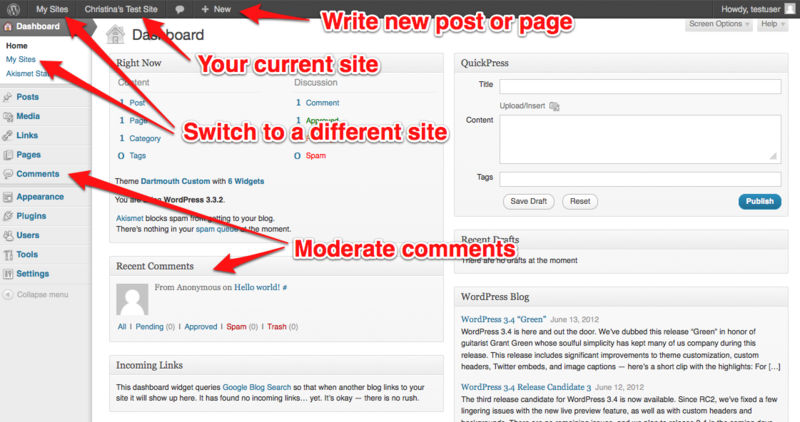 When you login to WordPress, you will be taken to the Dashboard. The Dashboard is the backend control panel for your sites. Here, you can create new pages and posts, manage comments, and activate plugins and themes. If you have access to more than one site, you can switch to the dashboard of a different site by clicking "My Sites," either in the sidebar or the top navigation.